Finals are done with, vacation has started, and holiday baking is at its highest peak to date! The baking started off with these brownies from Great Cookies: Secrets To Sensational Sweets. They were really easy to make, and the glaze meshed really well with the brownie part. 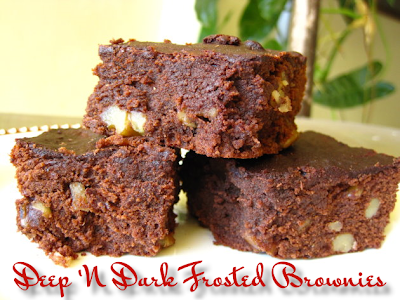 "This is a brownie for sophisticated palates, from an adventurous gal who knows a good thing when she tastes it! My friend and teaching compatriot Sally Kofke is known not only for her outstanding Italian cuisine but also for a dynamite brownie. This batter is richly flavored with premium chocolate, espresso powder, and freshly ground black pepper. After baking, Sally finishes her brownies with a satiny chocolate glaze. Take care not to overbake these brownies to retain their moist and chewy texture." 1) Position the shelf in the center of the oven. Heat the oven to 325F. Cut a 15-inch square of heavy-duty aluminum foil. Invert the 9-inch square baking pan and center the foil over the pan, pressing it across the bottom and down the sides. Remove the foil, turn the pan right side up, and place the foil shell into the pan, shaping it smoothly across the bottom and snugly against the sides of the pan. Thoroughly butter the foil, taking care not to tear it. 2) Place the chocolate in a heat-proof bowl set over simmering water. Slowly melt the chocolate, stirring occasionally, then set aside to cool. 3) In the bowl of an electric mixer fitted with the paddle attachment, mix the butter on medium-low speed until smooth. Add the brown sugar, espresso powder, vanilla, black pepper, and salt, mixing until blended, about 1 minute. Add the eggs one at a time, and mix 1 minute longer, scraping down the side of the bowl as needed. The mixture will look curdled. 4) With the machine off, add the melted chocolate, then mix on low speed for 15 to 20 seconds. Scrape down the bowl. Add the flour, mixing just until blended. Remove the bowl from the mixer and fold in the nuts with a rubber spatula. Scrape the batter into the prepared pan and smooth the top with the back of a tablespoon. 5) Bake for 35 minutes. A toothpick inserted in the center will still be wet. The brownies will set as they stand. While the brownies are baking, make the glaze. 6) Place the water in a microwave-safe custard cup and heat for 40 seconds or until steaming. Add the espresso powder and stir to dissolve. Place the dissolved espresso and the finely chopped chocolate in a small saucepan, add 1 tablespoon of the butter, and cook over low heat, stirring, until the chocolate is almost melted. This will only take a few seconds. Remove from the heat and add the remaining tablespoon of butter, stirring to incorporate. 7) Allow the glaze to stand for 5 to 10 minutes, or until slightly thickened, stirring occasionally. Do not allow the glaze to become too thick, or it will not spread. 8) While the brownies are still warm, pour the glaze over the top and spread it evenly using a small offset spatula. It is important not to overwork the glaze, or it will lose its shiny appearance. Allow to stand until the glaze is set. This could take a few hours, depending on the temperature of the room. When dry, using the foil as an aid, lift the brownies out of the pan and place on a cutting board. Smooth down the edges of the foil and cut the brownies with a long, sharp knife. Use an offset spatula to carefully remove the brownies from the foil.